…wearing this necklace on a daily basis. While I was visiting family in July, my mom was going through an old jewelry box, and this necklace immediately caught my eye. It was given to her as a child, from her mom. I don't have many heirloom sort-of-things (mostly because I've been far, far away from my family for almost a decade—and my mom wasn't exactly going to dole out a bunch of stuff to me when I left home at nineteen) and during my trip I told my mom that part of me feels like I've missed out. 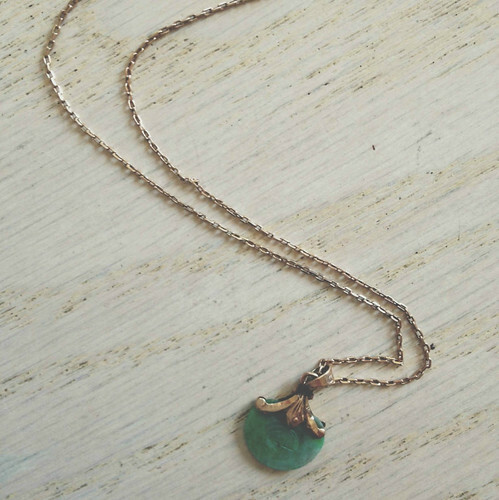 She ended up letting me keep this necklace, and sent me home with a few other treasures—which was the greatest thing. I'm so the girl who will want to someday fill her home with old, beautiful things, each with their own story. …dying from the heat, just a little bit. Late-summer heat wave, you win. I've refused to blow-dry my hair or go to the laundromat until the weather cools off, and no, neither of those things are going well, thank you very much. …loving the Simple Mom podcast, which I saw mentioned on Twitter today. I've been eager to find some new podcasts to listen to throughout the day (mostly while I work on the computer during Eisley's nap, and also while doing housework and/or dishes), and this one is so perfect for my life right now. Most of the podcasts I've listened to for the past few years are more educational or political, so listening to something a bit more easy-going, as well as directed towards my own life right now (and things that I'm actively going through), is very refreshing. …ready for scarf weather, cardigans, pumpkin-y beverages and baked goods, chilly evenings, autumn decorating, watching Home Alone on a weekly basis. …waiting somewhat impatiently for a couple of Amazon boxes, filled with items I ordered with birthday money. A new book, an iPhone case, a set of sketching pens. Oh, mailman! Where art thou? …so entertained by my daughter's rapidly expanding language. Her little quips and phrases absolutely make my day. Hearing her speak in full sentences is just surreal. I love how friendly she is when we're out and about, saying hello to everyone she walks by. She was trying on some of my shoes the other day, and when I told her it was nap-time, she walked around to all of them and said, "Bye-bye, shoes! Later!" and had to give each shoe a hug and kiss. I never want her to grow up. …reserving a bunch of books at the library. What would I do without that place? I can't get enough. …grateful for the encouragers in my life. So grateful. I love it :) And your daughter is just too cute for words. And I am terrible at waiting for things to come in the mail. HURRY UP ALREADY! Your necklace is gorgeous!! I look forward to the somewhat daily updates on Twitter about your daughter - they brighten my day! That necklace is absolutely gorgeous! And one day Eisley will adore it around her neck, too! I love her politeness to the shoes. & i'm so ready for scarf weather. i'm quite over this melting feeling every day. Pretty necklace! That must be cool, to be able to wear a piece of jewelry that has a past attached to it. I'm so ready for the fall weather myself! I love fall! I love what you said about your daughter telling her shoes bye! That is so cute! I love reserving books from the library too! And I love picking them up when they get there. "…ready for scarf weather, cardigans, pumpkin-y beverages and baked goods, chilly evenings, autumn decorating, watching Home Alone on a weekly basis." What a gorgeous necklace! I'm so drawn to heirloom jewelry, there is something so utterly special about wearing pretty baubles passed down from loved ones. I couldn't agree more about fall. Could it hurry up and get here already?